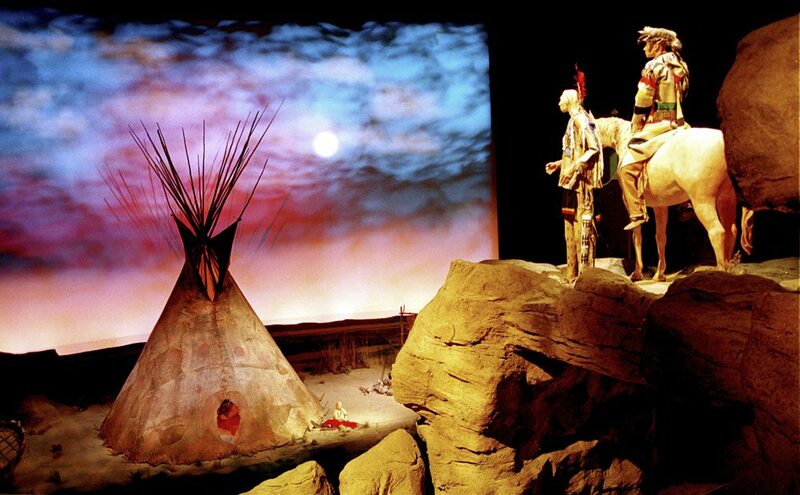 Authentic collections objects and multimedia interact in the Plains Indian Museum at the Buffalo Bill Center of the West. The Plains Indian Museum houses one of the country’s largest and finest collections of Plains Indian art and artifacts. Originating with the Northern Plains clothing and accouterments of primarily Lakota and Cheyenne performers assembled during Buffalo Bill’s Wild West shows, the collection has been carefully developed through the acquisition of major assemblages of Plains material culture including the collections of Milford G. Chandler and Richard A. Pohrt, Robert L. Anderson, J.R. Simplot, Royal B. Hassrick, and Adolf Spohr, as well as important individual objects. The museum’s collections contain superb examples of tribal artistry representing many Plains peoples—including the Lakota, Crow, Blackfeet, Cheyenne, Gros Ventre, Assiniboine, Mandan, Hidatsa, Arikara, Shoshone, and Arapaho—among others. 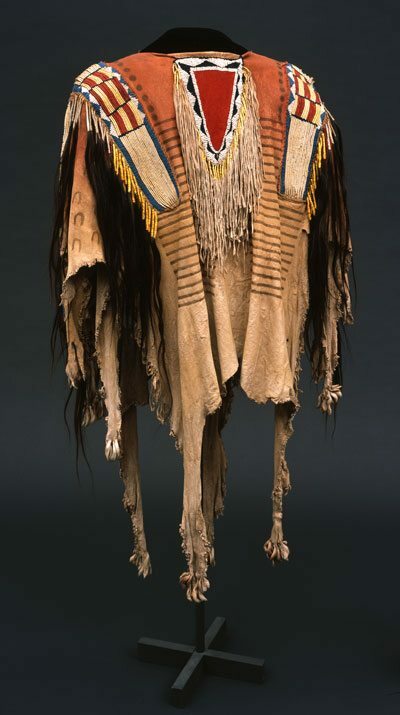 Many collection objects also carry considerable historical significance: items such as those traded by Sitting Bull to the post trader at Fort Randall, South Dakota, during his imprisonment there from 1881 to 1883, a shirt belonging to Red Cloud, and Southern Arapaho Ghost Dance clothing. The collections, consisting of more than 6,000 objects, include materials from the Northern, Central, and Southern Plains; Northwest Coast; Southwest; Eastern Woodlands; and the Plateau regions. More recently, the Museum has focused on acquiring the very best works of contemporary Indian artists such as Kiowa artist Vanessa Jennings (Paukeigope), Marcus Dewey (Northern Arapaho), Arthur Amiotte (Lakota), and Emil Her Many Horses (Lakota) to reflect the innovations and continuing traditional artistry of Plains Indian people. In September 2007, the Buffalo Bill Center of the West signed a gift/purchase agreement to acquire the Paul Dyck Plains Indian Buffalo Culture Collection, recognized as the most historic and important privately-held collection of Plains Indian artifacts, art work, and related materials in the world. The collection had been on loan to the Center while negotiations for its acquisition progressed over the previous fifteen months. The collection includes clothing, eagle feather bonnets, bear claw necklaces, buffalo hide tipis and tipi furnishings, shields, cradles, peace medals, moccasins, and much more. It dates from the late 1700s to pre-1890s, a period identified by Paul Dyck as the “Buffalo Culture” era. A special gallery space dedicated to the collection opened in 2013, and Buffalo Bill Center of the West staff members are currently planning for a traveling exhibition as well. The Center received two grants that made possible the on-site exhibition gallery, opened June 15, 2013, and a larger exhibition that will appear at the Center in the next couple years, and subsequently travel to several other venues. Click here to read the full news release. The Paul Dyck Plains Indian Buffalo Culture Collection was acquired through the generosity of the Dyck family and additional gifts of the Nielson Family and the Estate of Margaret S. Coe. The Wyoming Humanities Council, the Margaret A. Cargill Foundation, and Deborah and Rusty Rokita supported the creation of the Paul Dyck Plains Indian Buffalo Culture Gallery.